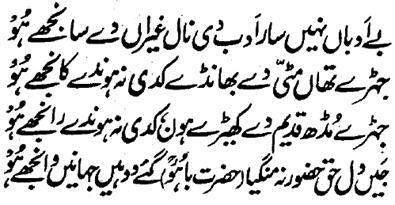 In these couplets, Hazrat Sultan Bahu Rahmatu-Allahe Ta-aala Alaihe hints about those unfortunate and unblessed people since Azal, who are not convinced for the Marifat, Qurb, Mushahida and Wisaal of Allah Almighty in the world even if they are given many advices and sermons and are shown countless Kashf and Karamaat and miracles because they are blind. In addition, they do not accept the Talqeen and Teachings and the Tawajuh and effect of Aulia-Allah as they consider the Holy Prophets Alaihimus-Salaam and the Aulia-Allah Rahmatu-Allah Ta'ala Alaihim and do not observe any kind of deference and reverence for them and instead they deny them and show disrespect and complaint against them. Such people leave this world empty handed and without earning the bounties of Both-the-Worlds. Their example is like those utensils of mud, which crack under a little heat or pressure as these have no endurance and tin platting of the name of Allah Almighty cannot be done on their surface. Their likeness is as the rival 'Kherha' who cannot become the Lover 'Ranjha'. In the garden of Mustafa Sal Allahu Alaihe Wa Aa-lehee Wa-sallam , blessed persons came from far off places like Hazrat Hassan-Basri Radhi-ya-Allahu Ta-aala Anhu from Basra, Hazrat Bilaal Radhi-ya-Allahu Ta-aala Anhu from Habsha and Hazrat Suhaib Radhi-ya-Allahu Ta-aala Anhu and received the Beneficence and quenched their thirst but the unblessed persons from locality like Abu Jehal remained deprived of and unblessed besides the fact that he lived in the vicinity of the Holy Prophet Sal Allahu Alaihe Wa Aa-lehee Wa-sallam because his nature was bad and unchangeable. 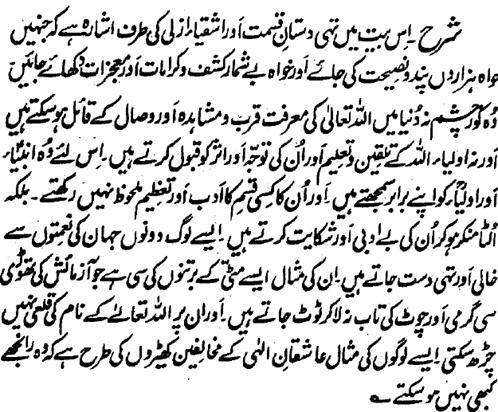 Similarly a person remains unblessed if his fortune is a misfortune since the beginning no matter even if he is led by a Murshid-e-Kaamil same as the case of Alexander who could not drink the Water of Life even in the guidance of Hazrat Khizar Alaihis-Salaam .